A trip in one of the 55 cabins or suites aboard the SeaDream II promise a comfortable journey in the most elegant surroundings. The suites are spacious and feature with a separate dining and living area along with a luxurious bathroom with a shower and bath. 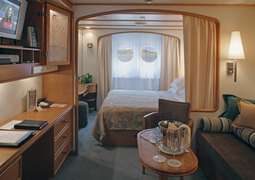 The approximately 18m2 outside cabins feature two single beds or one queen-sized bed and a marble bathroom with a shower. 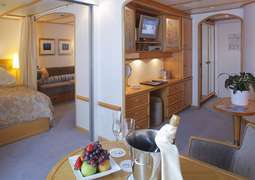 There is also an amazing entertainment system in every one of the ship’s cabins and suites. Additionally you will have a 24 hour room service available to you. On board the SeaDream II you will get the most excellent food and wine and the skilled kitchen staff ensure that they meet your every need. In order to guarantee freshness and quality in your meals, many ingredients are selected at the ports visited during the trip. Early birds can enjoy a special breakfast and on deck six one can dine under the stars. At the “Top of the Yacht” bar you can unwind at the end of the day with a delicious drink. There is so much to do on board the SeaDream II such as watching a fantastic movie in the open air or having a fun game on the Wii. Then why not try your luck at the casino with a game of roulette or relax at a bar with live piano music. For a quieter holiday visit the amazing library on board. There is no such thing as boredom on board the SeaDream II: one can partake in a number of activities such as having a nice cooling swim in the outdoor pool, working out at the gym or relaxing in the Jacuzzis. There are many water sports available in the ship’s marina such as kayaking, water-skiing and trampolining on water. The fitness centre with its many machines and weights welcomes you, and towels and cool drinks are available for afterwards. Daily tai chi and yoga sessions allow you to have a unique relaxing session and during good weather they are even held on the beach. If you fancy a game of golf then have a go on the golf simulator on board. In the beautiful spa area you can enjoy a variety of different treatments performed with the utmost care from eight professionals, helping you to forget all your worries. The spa is the only one at sea certified by the Thai Spa Association. Whether you would like designer clothes, beautiful jewellery or watches there is a duty-free shop on board offering all these products to give you a little reminder of your trip to take back home. Spend a night in the Balinese Dream Beds in the open air and you will also have personalised stationery awaiting you in your cabin. There is no fixed dress code aboard the SeaDream II, whether you prefer casual or formal, it is entire up to you what you feel most comfortable in.